Need a tool that can help you out with your trading? Do you want to ease your trading on the stock market? 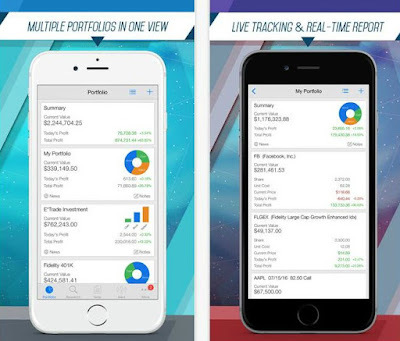 No worries, we have found one of the most amazing finance apps on the iOS platform, called Active Portfolio. Developed and designed by Mobile Interactive, this stock portfolio tracker is very easy to handle and offers dozens of features that you will find helpful. First, download the app and then you will have all your financial interests always at your fingertips. Once you start it, you will be able to enjoy its fast performance and multiple offered options, such as create and manage unlimited portfolios, track the value, the performance, the loss and many more. Making research notes has never been easier, as well. Customize your own backgrounds for each portfolio, adjust the content, make the app secured with choosing a password and always stay notified. You can push the notifications and receive alerts for any news, earnings, dividend, insider trading, etc. The Active Portfolio app covers almost everything you need to know about the stocks in the US market. It is all packed up in a beautiful and easy-to-use design and it offers you easy live-tracking and real-time report. Get it now, download it for free from the App Store!